I am faced with an overload of books. I love books but my space is limited. 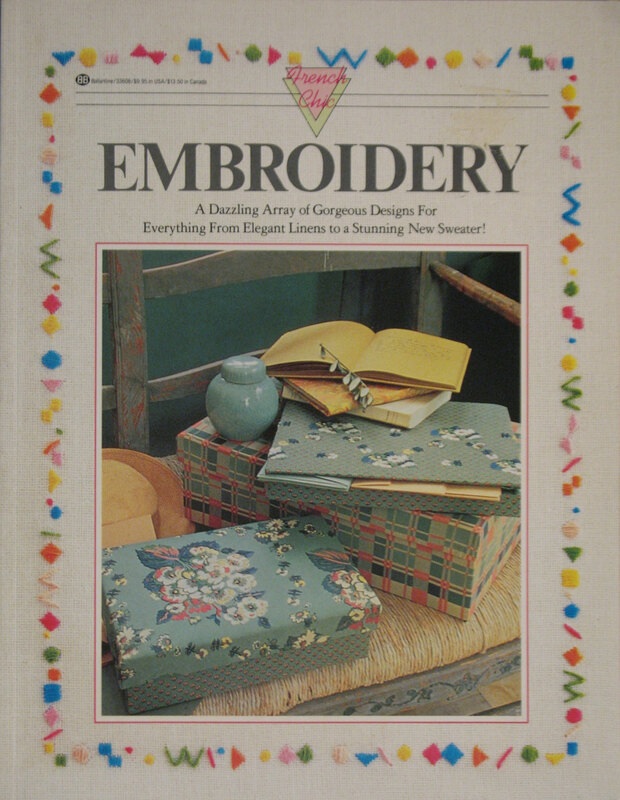 I have books on needlepoint, embroidery, stitch patterns, design, drawing, color, fiber art, mosaic art, stained glass, samplers, and quilts – still not an exhaustive list! So, I will donate some that really do not have enough of interest in it to retain. For several years now, I have contemplated how to record these in some manner so that I know what I have owned so I do not buy them again! I need it handy to pull up & be searchable. I have not gotten the hang of any of those doc storing websites. Since I want it when I am traveling and I have a cell phone with internet connection, I decided to enter it into my blog & the blog is searchable. These are in no particular order. 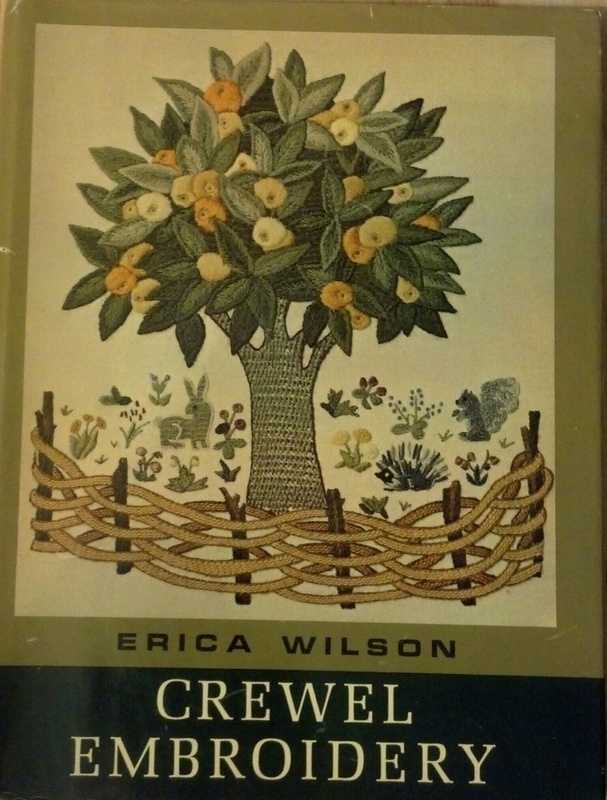 Crewel Embroidery by Erica Wilson is from the early 60s and the best design is on the cover. Very few color photos. The stitch diagrams I can get in other books. 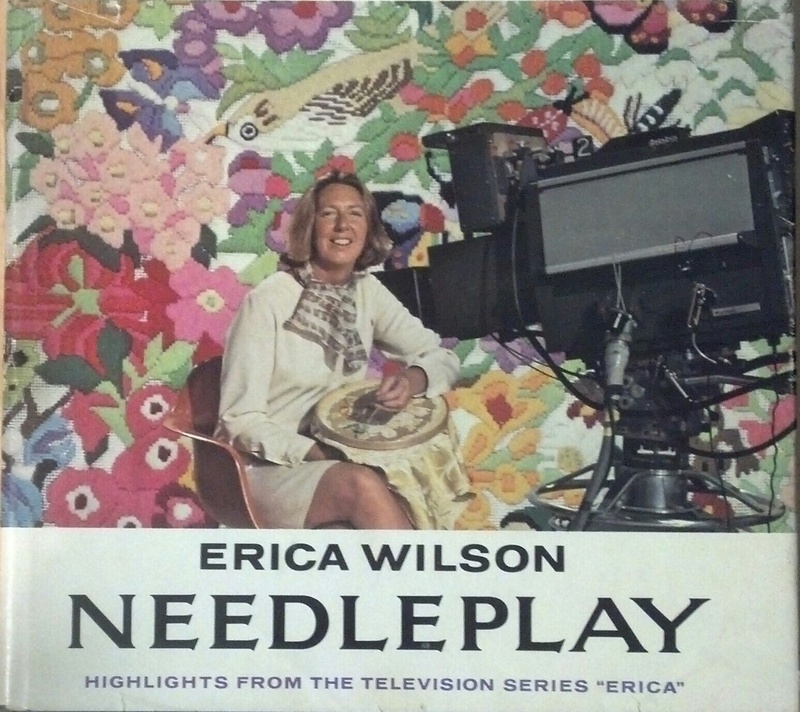 Needleplay by Erica Wilson is from the 70s and is very colorful and big using more wool – not my taste. 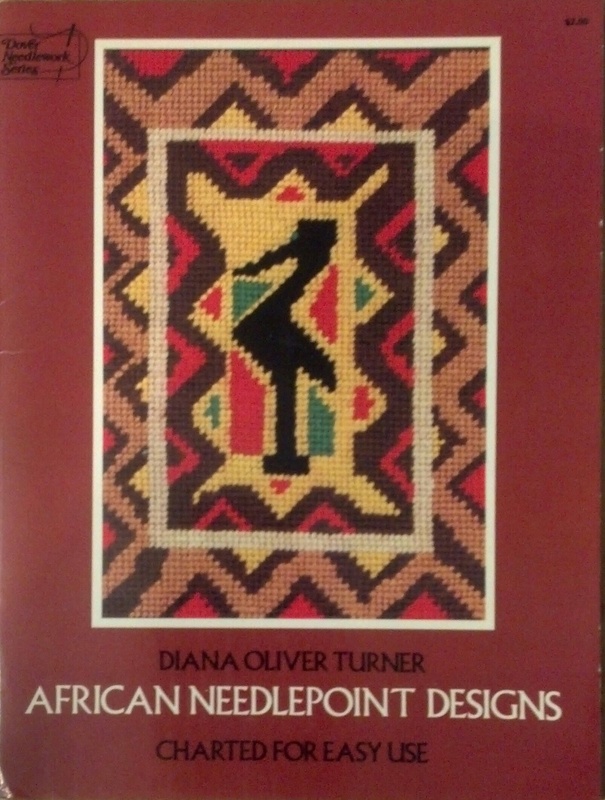 African Needlepoint Designs by Diane Oliver Turner has very simple patterns and designs – very colorful. 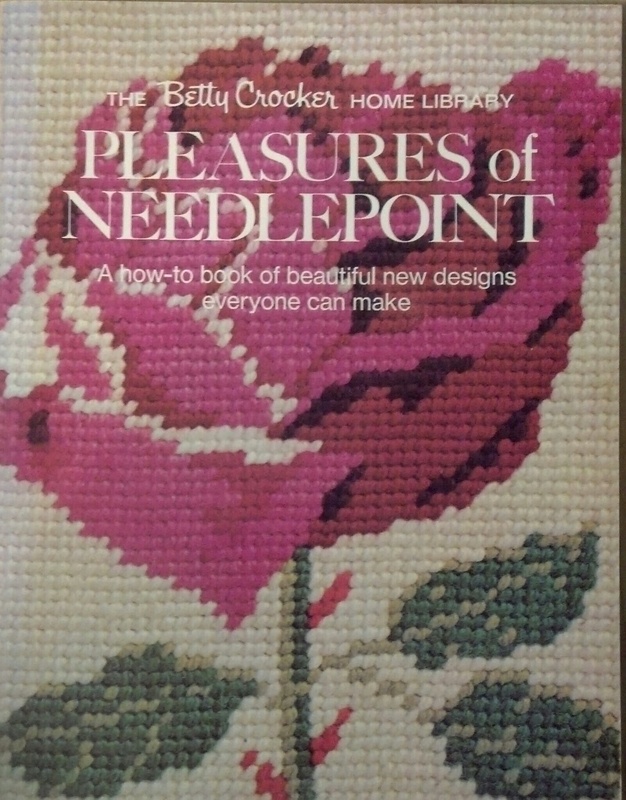 Pleasures of Needlepoint by The Betty Crocker Home Library presents all projects as tent/basket weave but has no designs that are interesting. 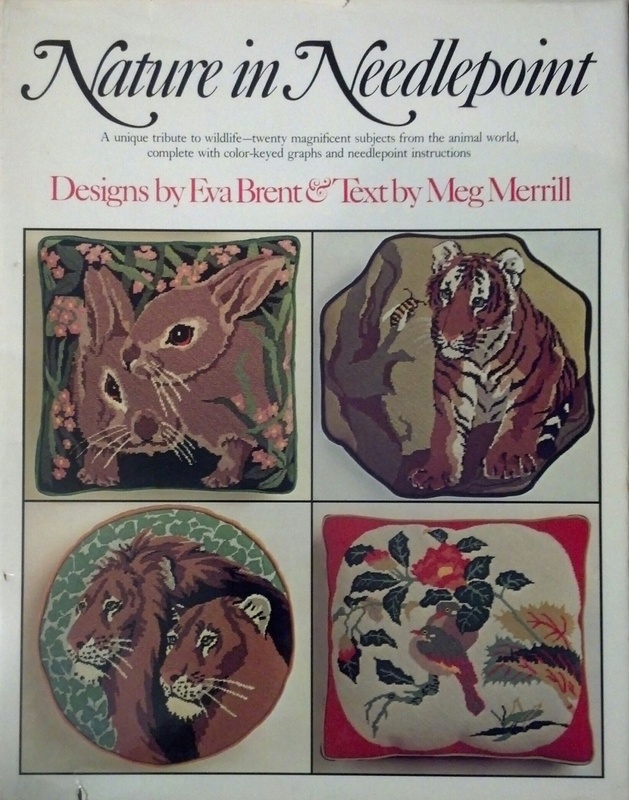 Nature in Needlepoint by Eva Brent and Meg Merrill has black and white patterns with coded squares which doesn’t thrill me but I wouldn’t do these designs anyway. 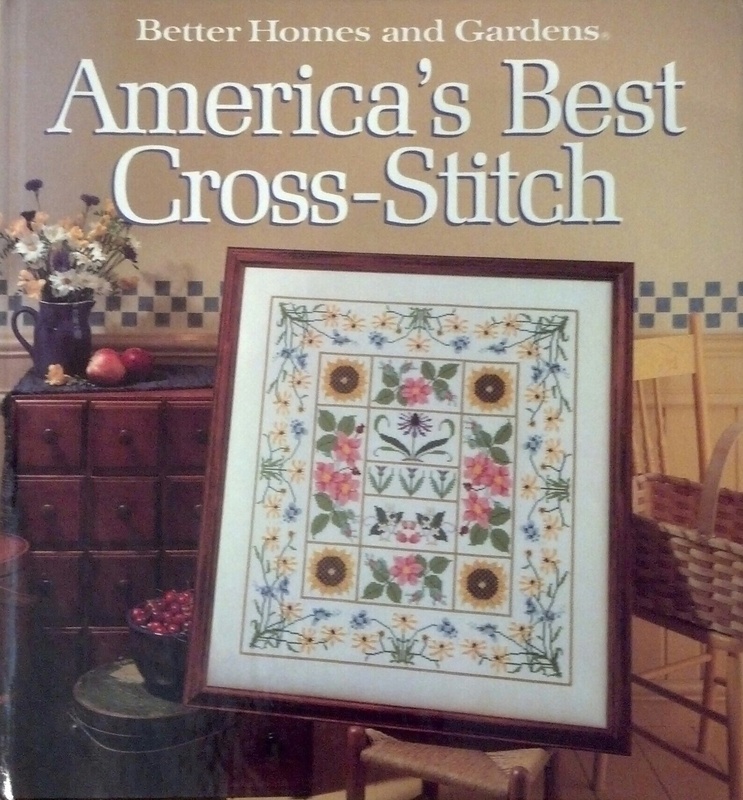 America’s Best Cross-Stitch by Better Homes and Garden has good color pictures and charts but I don’t do much cross-stitch now & no design thrills me. 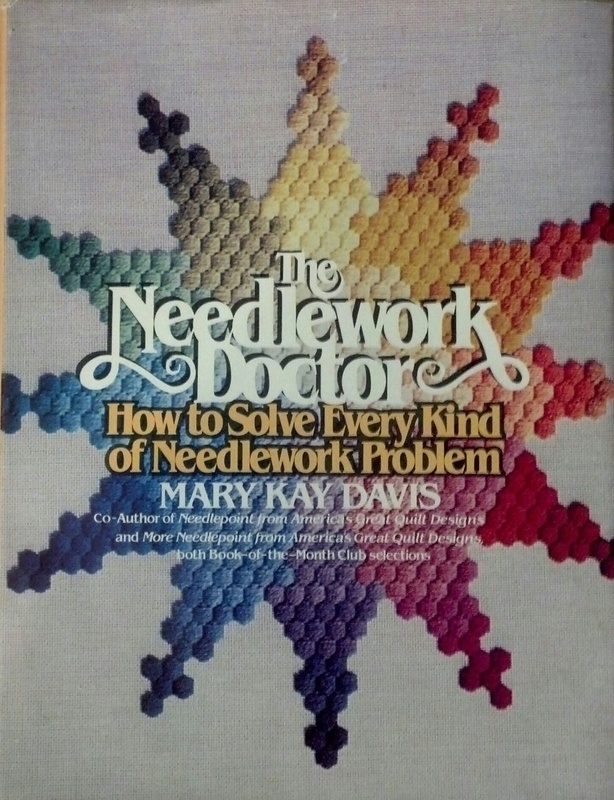 The Needlework Doctor by Mary Kay Davis has a fantastic question and answer format for “How to Solve Every Kind of Needlework Problem” but is dated (talks about 35 mm slides). 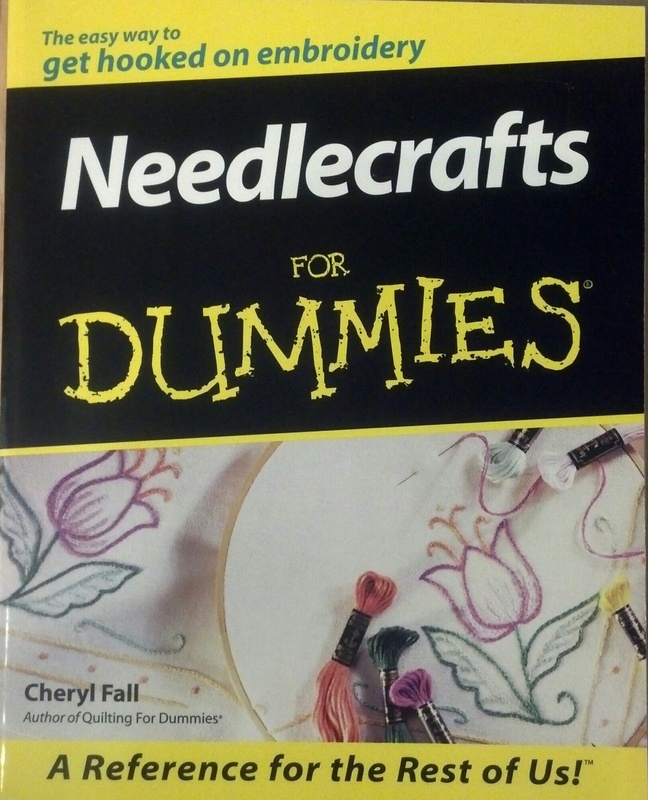 Needlecraft for Dummies covers a wide range of topics from getting started to finishing, stitches, various techniques, and some projects (none thrill me). But, it doesn’t cover anything that I can’t get out of other books. 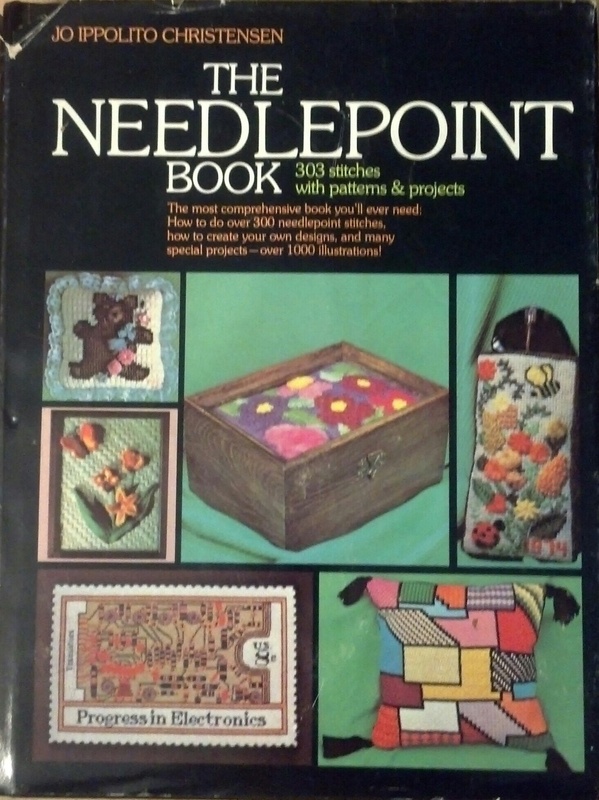 The Needlepoint Book by Jo Ippolito Christensen from 1976 with 303 stitches, patterns & projects. While it it would be fun to keep as a historical reference, I have the more updated 2nd edition and will probably get her 3rd edition at some point (maybe electronically though). 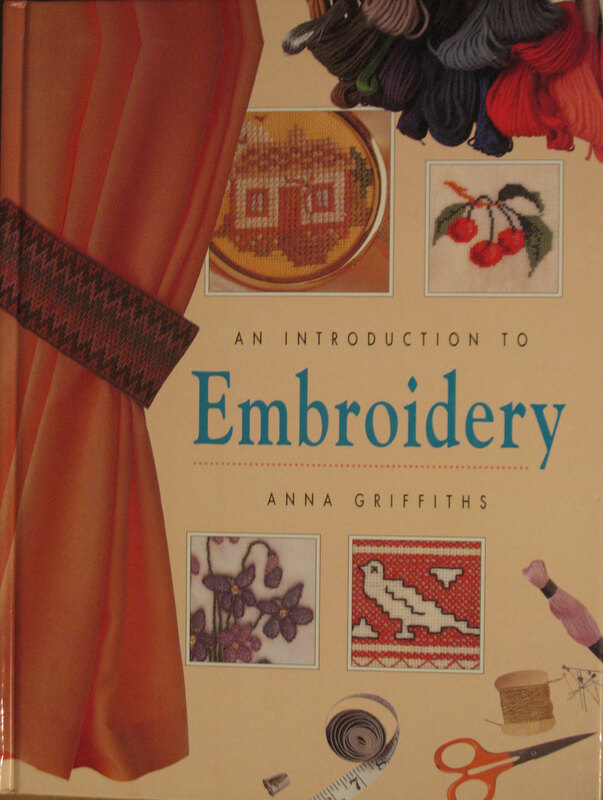 An Introduction to Embroidery by Anna Griffiths has great examples of free embroidery, and modern blackwork but the canvas work section is disappointing. I have a duplicate of this that I am keeping. Crewel Embroidery with texture and thread variations by Audrey Francini has detailed stitch diagrams, easy to follow patterns, instructions from start to finishing, & discussions on color and design. No design wows me & I have books that cover the other topics. 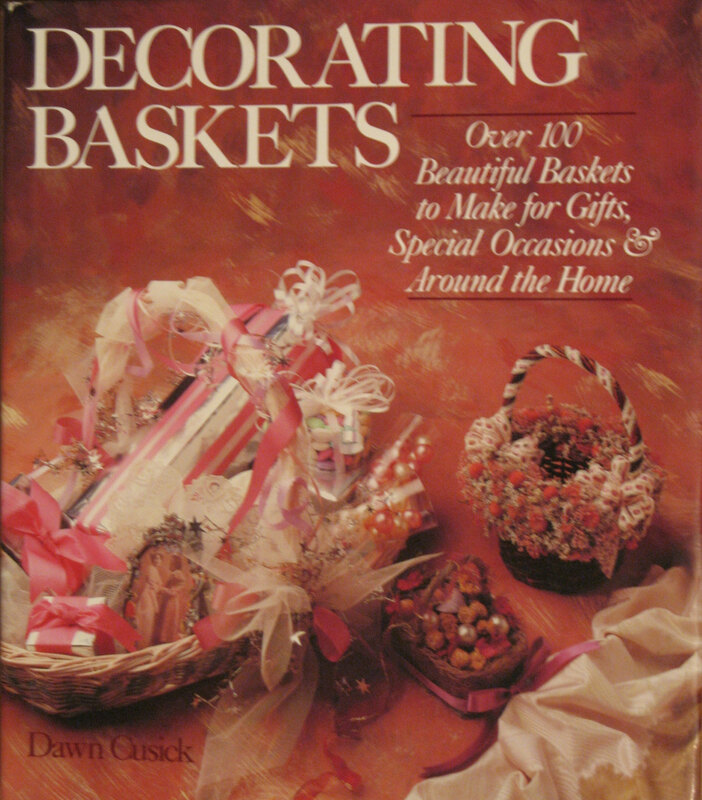 Decorating Baskets by Dawn Cusick has over 100 beautiful baskets and instructions on how to make them but I didn’t find enough baskets that had designs I liked to warrant keeping the book. 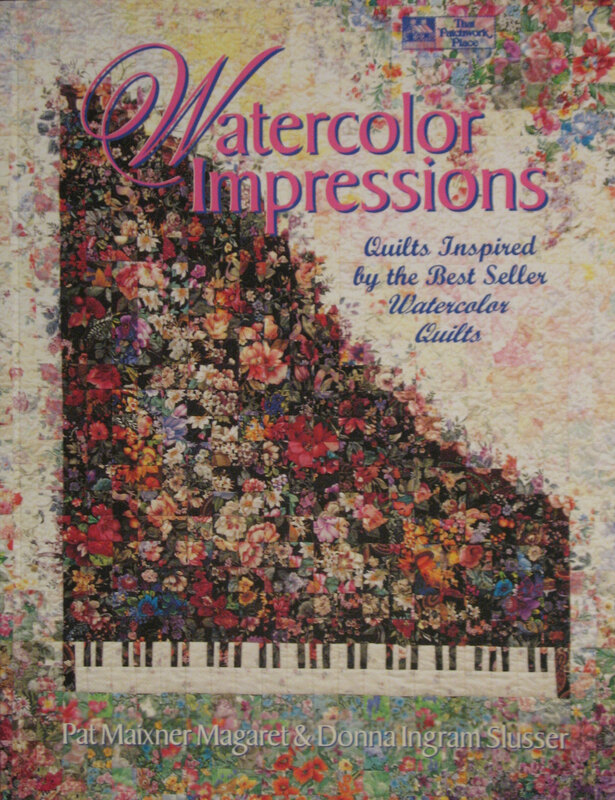 Watercolor Impressions by Magaret & Slusser has 74 watercolor-quilt impressions that utilize gradual movement from light to dark. 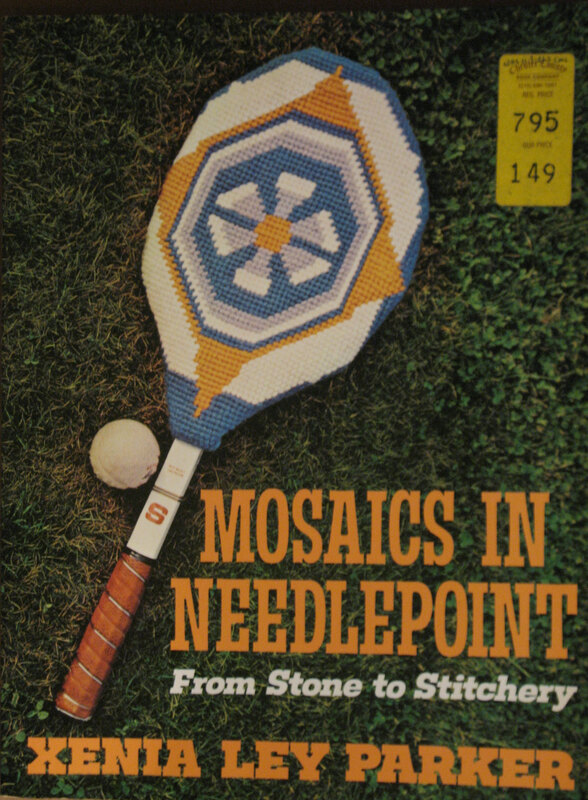 They are fascinating but I do not see myself using this style in needlepoint pieces. Small Scale Embroidery by Brenda Keyes has cross stitch, blackwork, goldwork, whitework, canvas work, beadwork, bargello, and assisi. There are some very cute designs but none I would actually stitch. 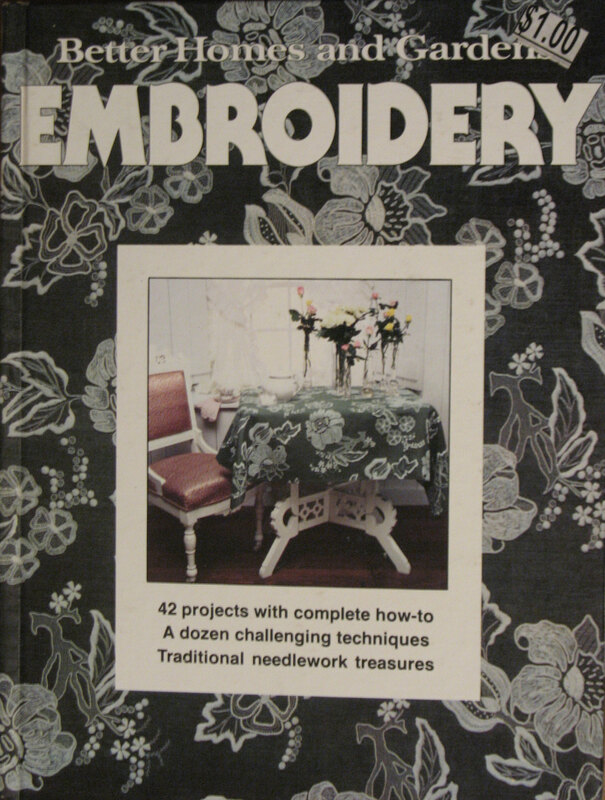 However, I may place some of crochet or tatting in a needlepoint piece of mine as you see in the cover top center picture. 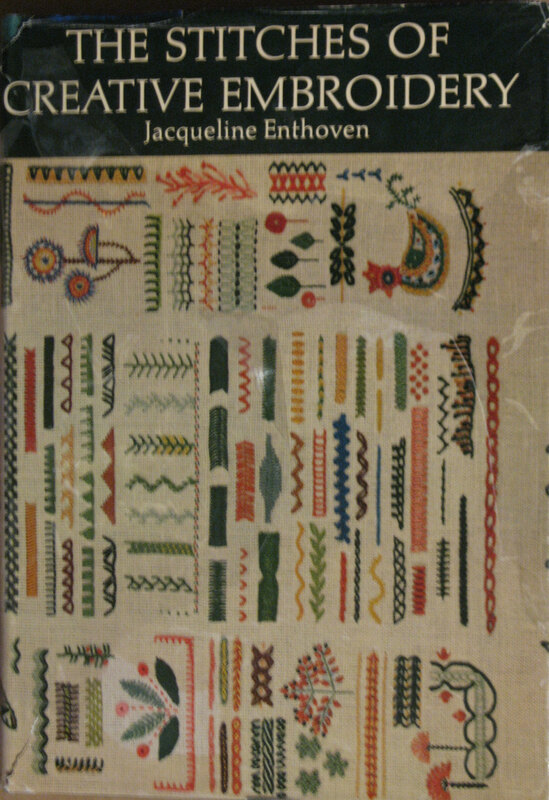 The Stitches of Creative Embroidery by Jacqueline Enthoven is the hard cover first issue from 1964 and I have the soft cover revised version that I am keeping. Mosaics in Needlepoint by Xenia Ley Parker goes through the process of transforming designs into mosaics using line drawings and then shows about 2 dozen stitches to use. Again, the designs do not thrill me. So, there really was nothing new in the book that I need to keep it. 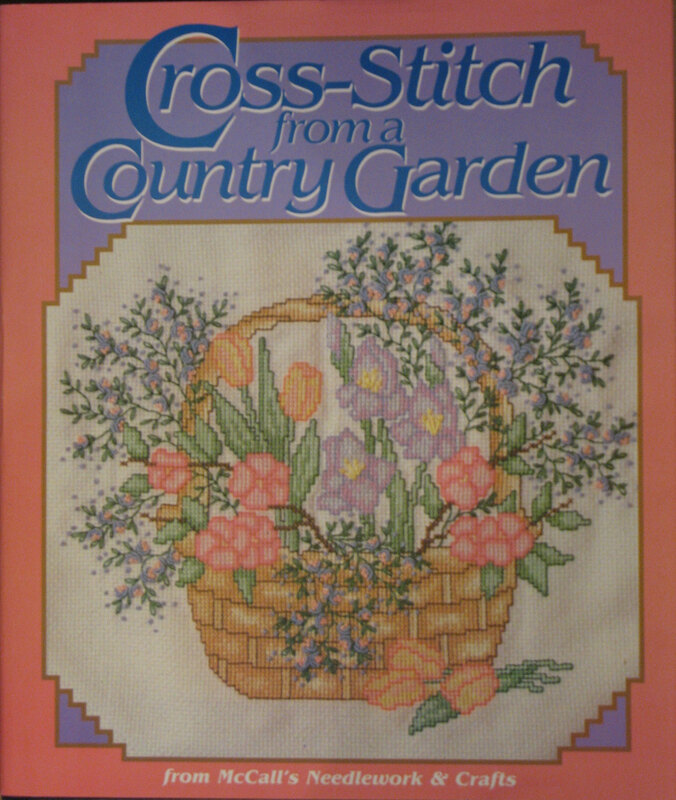 Cross-Stitch from a Country Garden from McCall’s Needlework & Crafts has over 90 projects including coasters, napkin rings, placemats, picture frame, and many more with excellent charts for counted cross stitch. 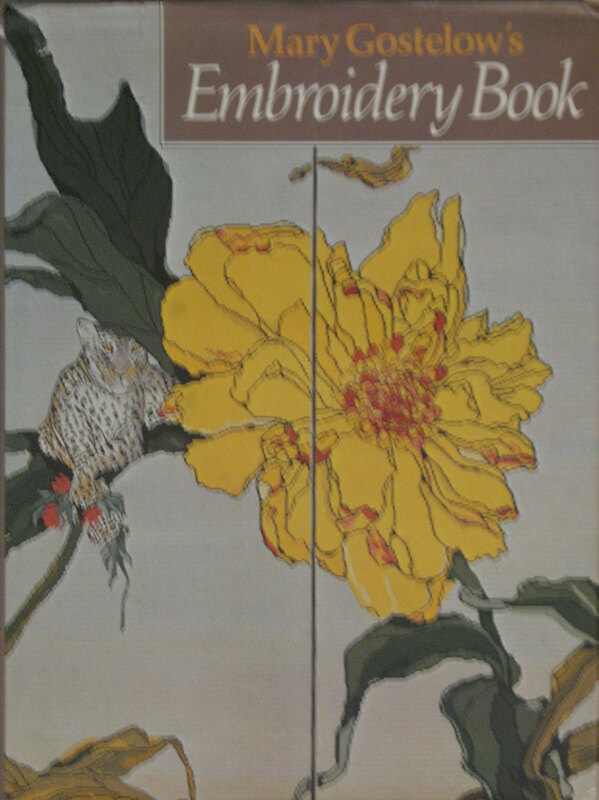 Embroidery from Better Homes and Gardens has 42 projects in a dozen techniques and presents good diagrams for basic embroidery stitches. It is an interesting collection of pieces with influences from across the world but nothing really appeals to me. Apparently, my tastes change over time but I did like this book enough to buy a second one! I really need this list. Embroidery from French Chic uses 16 basic stitches and DMC floss on anything from t-shirts to tablecloths. 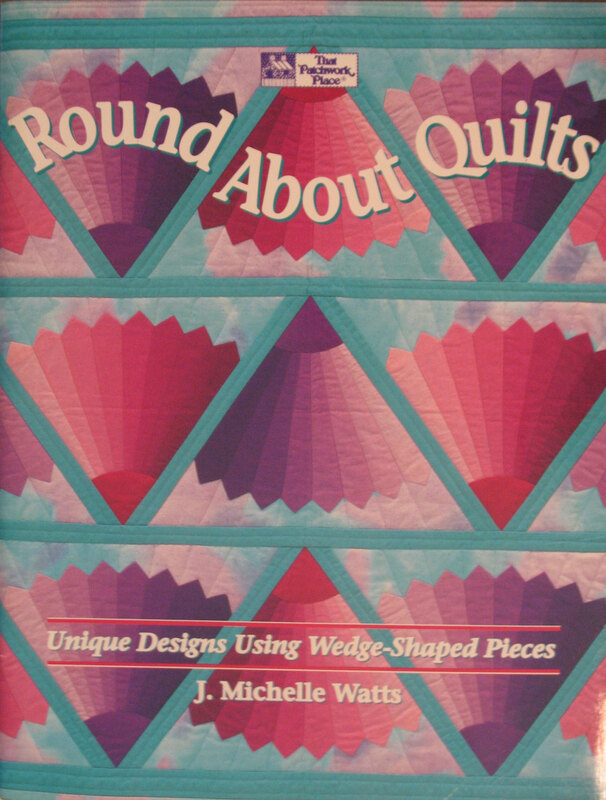 Round About Quilts by Michelle Watts uses wedges to form a circle and squares them off. 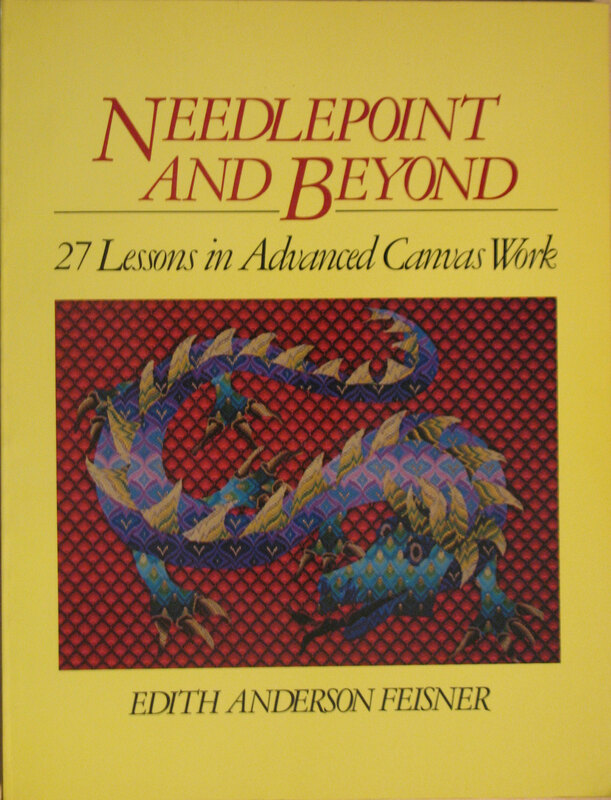 Needlepoint and Beyond by Edith Anderson Feisner has over 200 illustrations. 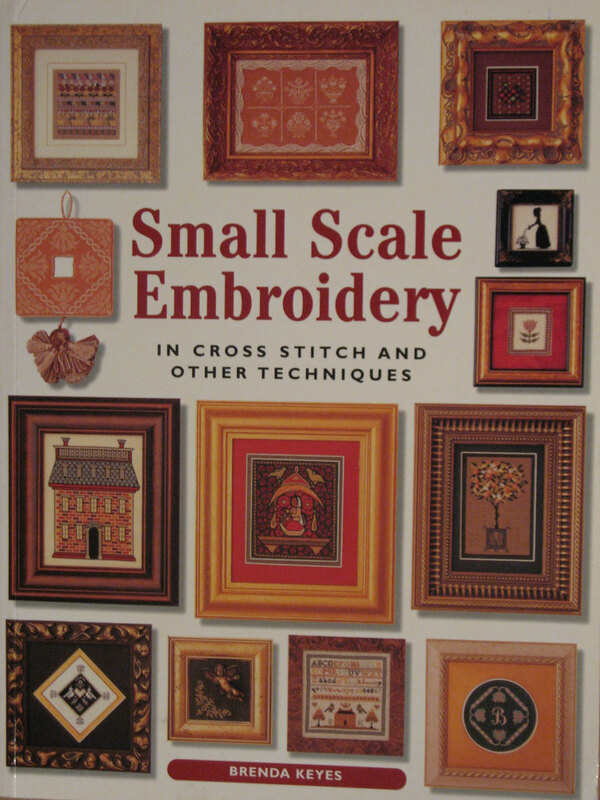 She covers tools, stitches, designs, color, texture, shading, borders, needle weaving, appliqué, placing objects on canvases and more – in just 175 pages. I just prefer books with color. 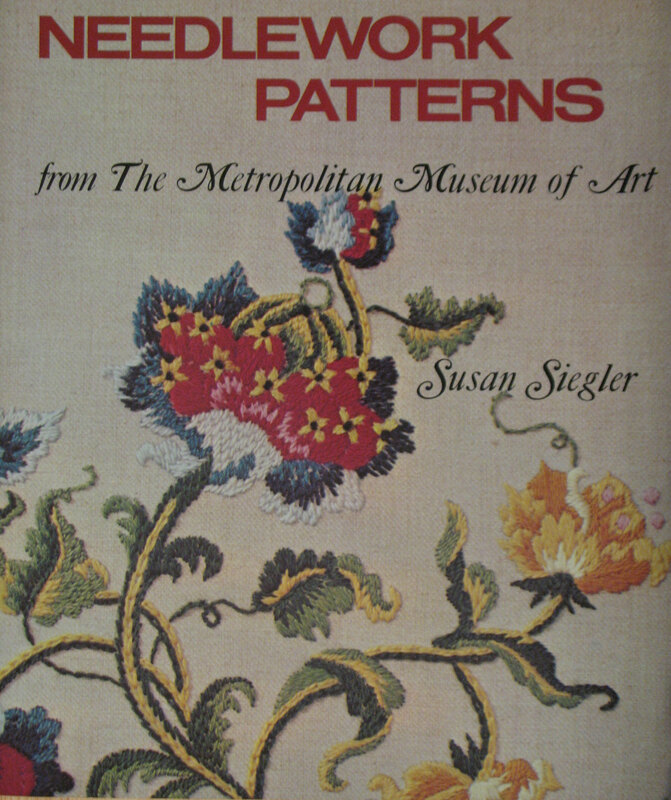 Needlework Patterns by Susan Siegler adapts 24 textile pieces from The Metropolitan Museum of Art into needlepoint. I just don’t care that much for the items she selected. 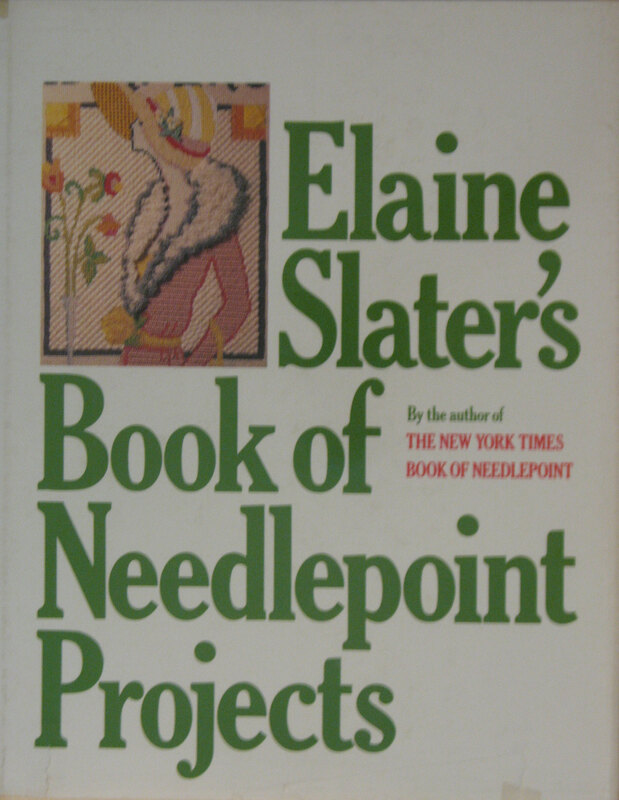 Book of Needlepoint Projects by Elaine Slater discusses working on a painted or blank canvas, tracing your own design, and working from graphs. The section for stitch diagrams breaks many stitches into so many steps that it spans as many as 4 pages with large diagrams and a lot of text to read. Kyuuto! 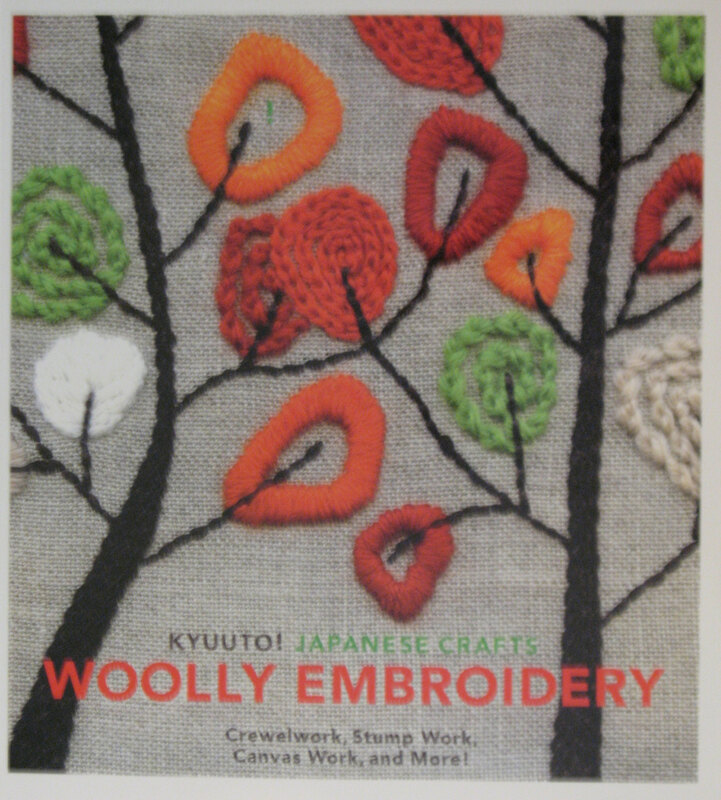 Japanese Crafts: Woolly Embroidery by Chronicle Books is an uniquely Japanese technique called Kyuuto – it has crewel, stump work, and some embroidery. On the back cover page, I finally learned that Kyuuto means cute. Some were cute but not cute enough to keep the book! 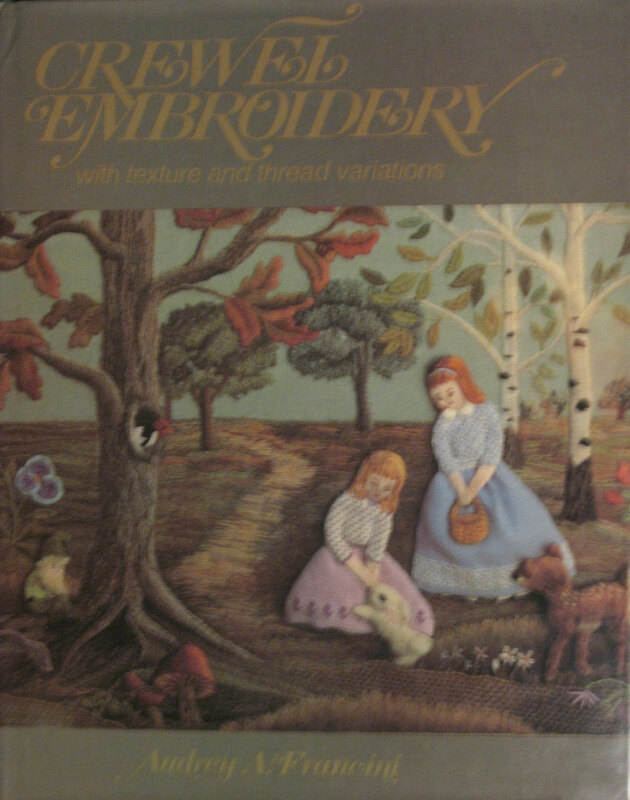 Embroidery Book by Mary Gostelow is a comprehensive reference book with stitch diagrams and 6 projects. I just do not care for the diagrams and covers topics I have in other books.